Could bike trails help connect Milwaukee’s poorer neighborhoods to jobs, education and essential services? The fact that the question is even being asked suggests how radically we’ve changed our perspective on cities: biking is increasingly seen as a key part of urban transportation solutions. The question is posed in a new study, “Reconnecting Milwaukee,” by the Rails to Trails Conservancy, which is involved in an effort to expand the number of bike trails in southeast Wisconsin — which now totals 300 miles — and increase it to 500 miles. A key part of that effort involves the City of Milwaukee, so this study looks at the potential to increase bike transit here. The bad news is that the study identifies yet another way Milwaukee is unequal: in access to bike trails. The ability to get to key destinations via biking or walking is particularly important “in neighborhoods experiencing inequality, where oftentimes few people have access to a car,” the study notes. Yet it is exactly those neighborhoods — with high rates of poverty, unemployment, high school dropouts and large African American and Hispanic populations — that have the least access, the report found. The report offers a potential solution: this inequity could be dramatically reduced by adding two key bike trails — along the Kinnickinnic River on the city’s South Side, and along the 30th Street Corridor on the city’s North Side. But that could take years to accomplish. The study’s authors praise Milwaukee’s “exemplary” bike trails, including the Oak Leaf Trail and Hank Aaron Trail. The latter goes west from Downtown up the spine of the city to Wauwatosa, giving access to many. 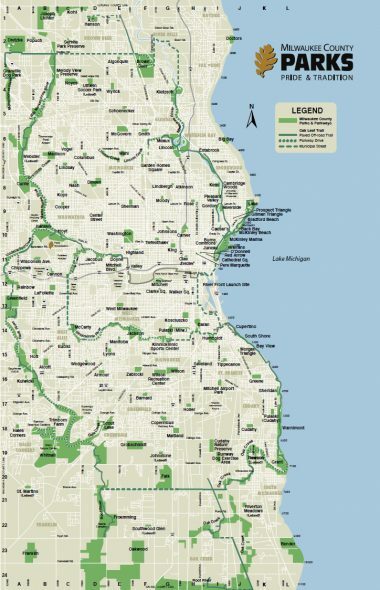 “With 450,000 people living within 3 miles of the Hank Aaron State Trail, the corridor provides a vital connection between Lake Michigan, a variety of diverse neighborhoods and many of the state’s most popular destinations,” including the Milwaukee County Zoo, Wisconsin State Fair and Miller Park, the study notes. The study created a “connectivity score,” examining which neighborhoods have “low-stress” biking routes by mapping multi-use trails, on-street bicycle lanes, and other streets that have a speed limit no higher than 25 mph and two or fewer lanes of car traffic. The study found that 59 percent of residents are connected through low-stress routes “to a majority of key destinations such as schools, libraries, grocery stores, and hospitals” within two miles. But only 40 percent of residents are connected to at least one employment center within two miles. “Milwaukee is home to amazing trail facilities, but those trails do not reach residents in the north-central or south-central neighborhoods of the city. These communities are left isolated by physical barriers and unsafe streets, reinforcing patterns of segregation and inequity in the city,” the study found. The study notes that major infrastructure like the freeways can create obstacles to bikers. Another obstacle to biking connectivity is the fact that “Downtown Milwaukee has a high concentration of high stress, moderate stress and restricted access routes that limit the bicycling potential in the area,” the study found. Another likely but unmentioned factor in the city’s biking inequity is that Milwaukee’s “Emerald Necklace” of parks was created after much of the original city was settled, as this map of county parks shows This left densely settled areas on the city’s north and south sides lacking much park land which might accommodate bike trails, though the problem is worse on the north side. Today, only about 24 percent of all Milwaukee residents live within 2 miles of a trail. This is the maximum distance that most people are willing to bike. In the neighborhoods experiencing inequality, that percentage falls to just 8 percent. But adding two new pieces of trail infrastructure—the 30th Street Corridor and Kinnickinnic River Trail—along with extensions of existing trails, would greatly increase the percent of residents within two miles of a trail, the study found, from 24 percent to 59 percent for all residents citywide and from 8 percent to 66 percent for residents in lower income areas. In neighborhoods experiencing inequality, the number of residents able to access a trail would jump from 25,000 to 200,000. But the city is a long way from building either trail. The KK trail is more likely. As Liz Thorstensen of the Rails to Trails Conservancy notes, the eastern portion of the KK trail has been created, the middle section has been planned and the western section hasn’t even gotten to that point. The KK River project is being done in conjunction with the Milwaukee Metropolitan Sewerage District’s plan to eliminate the concrete banks of the river and return it to its natural state. But no one I contacted at the city seems to know how many years or how much funding will be needed to complete the bike trail. As for the 30th Street Corridor, its potential for connectivity is huge, because it is a massive stretch of land, “from Hampton Avenue all the way south to the Menomonee Valley, some four miles long,” as Susan Nusser has reported for Urban Milwaukee. “It encompasses 880 acres, or the size of about 660 football fields.” The project to redevelop the corridor has been going on for years, and involves a huge cast of characters, as Nusser noted: the State of Wisconsin, the city, the Milwaukee 7 regional business group, businesses in the corridor, real estate and property developers, environmental regulators, the Milwaukee Metropolitan Sewerage District, the EPA, neighborhood associations, and area residents. For that and other reasons, progress has been very slow. And a biking trail — which has never been discussed by the city — is likely to rank at the bottom of a long list of other priorities for the corridor. That, of course, is a key goal of this study, to bring attention to this possible project, as Thorstensen notes. If you’re going to redevelop the corridor anyway, it might be easier and cheaper to do the bike trail as part of the effort. But the cost and practicalities of such a project have yet to receive any analysis. She compared the 30th Street Corridor to the Midtown Greenway in Minneapolis, which was converted it to a rail-trail, beginning in 2000. “They built a world-class facility,” Thorstensen noted. For now, this new study has put the issue of bike equity on the map and helped dramatize how the city could become a better connected and more equitable community through the most modest of transit options: the bike. It’s an option an increasing number of Milwaukeeans are coming to embrace. I tried to bike to work from the 50th and Wisconsin to 4200 N. Teutonia. In order to get there, I had to bike on Capitol Drive from Roosevelt to 34th St. on the east side of the railroad tracks– the traffic was always heavy and often hazardous. I gave up after only a few scary experiences. I think a 30th St. corridor bike trail would be a great addition to making biking a safe alternative to driving. I ride the Lloyd street, Lisbon, Walnut, Pleasant st. bike lane route to Riverside University High School. With the new surfaces and bike lanes added the past 5 years, it has made this one of the best east – west bike streets in the city. I have access to 10 bus routes along my ride. I often take them (with my bike) during rain or if I am late to or from work during rush hours. 1. We have to look at getting future generations to bike through the urban neighborhoods. We can start by assisting all the high schools in Milwaukee with a. starting biking clubs after school with staff b. get bike ownership up with our teens and help them find safe routes to their high schools c. start bike events at each high school introducing bike riding, safety and bike clubs to children with the teens as the peer educators. Peer teaching has the greatest impact on children. 2. Recruit teens from the high schools in the planning, designing and promotion of using bikes, bike trails, bike lanes and connecting routes starting this school year. We have 300 teens who bike at Riverside University High School. Most in gym classes, some after school with the bike club, triathlon team and mountain biking team. LETS MEET! And start our first Urban Bike Summit in the 2017/18 school year. We can meet, talk and ride together! 3. A new vision for Vliet Street: It is the last east west street to be resurfaced on the North side of Milwaukee. Before work starts we may want to look at making it Milwaukee’s first “Bike Boulevard”. It is wide, it is not a major route out of the city and traffic is minimal compared to all other north side streets out of down town Milwaukee. But, the connections Vliet street has for residents on Milwaukee’s North side to work and school are HUGH! Vliet street connects down town Milwaukee and the west side all the way to Wauwatosa with the Milwaukee Bucks arena, Pabst development, Joseph Zilber School of Public Health, Milwaukee County Health & Human Services offices, Marquette University, MLK Park, Milwaukee High School of the Arts, Washington Park, Miller Coors, Harley Davidson, Miller Park, VA Center, Wick Field, Milwaukee Public Schools offices,Hawthorn Glen, Wauwatosa, Tosa Village, Hoyt Park & Pool, Milwaukee Regional Medical Center, Milwaukee County Research Park, Milwaukee County Zoo and The Oak Leaf Bike Trials north along the Menomonee River and south through West Allis, Greenfield Park and connects with twelve or more county bus routes. How many Milwaukee urban residence will have the primer urban bike route that connects 100,000’s of it’s residents of low, moderate and upper income to this amazing variety of jobs, schools, parks, universities, restaurants, places of worship, or just out for a easy short walk or bike ride on a weekend? The improvement for the health and wellness of individuals, families, workers, students and any private or public agency along this corridor is the most important reason to design and build it. It is the right thing to do because it will increase safe bike routes to the 100,000’s of residents who are not connected toe the “Emerald Necklace” of parks. Financing for Vliet can be do faster that the 30th Street Corridor and KK because the street is due for repavement. The city of Milwaukee and all organizations invested in biking should be able to find funding to help make the Vliet Street Bike Boulevard concept a world class bike route for it’s urban citizents. Now add to all of this to the 30th Street Corridor proposal. At some point we need to look at other routes above North Ave to Brown Deer, but this gives us two major bike routes to connect future neighborhood bike routes to through out the north and west side of Milwaukee. Not only to jobs, education and essential services….but health and well-being! Hey bikers! Doggies & walkers get to use the trails TOO and if you have to slow down or adjust your trajectory for a brief moment that’s just too damn bad. Your personal Tour de France will wait so stop acting like dicks and dickesses.